The annual Powell Festival, presented by Mount Carmel, is set for Friday and Saturday in Village Green Park, 47 Hall St. It will be open from 5 to 11 p.m. Friday and noon to 11 p.m. Saturday. The annual Powell Festival, presented by Mount Carmel, is set for Friday and Saturday in Village Green Park, 47 Hall St. This year marks the 20th anniversary of the community event. The festival is a free event, featuring family-friendly entertainment, food, endless activities for children, shopping and more. It will be open from 5 to 11 p.m. Friday and noon to 11 p.m. Saturday. Friday’s lineup of entertainment includes DJ Matty Sexton, 5 p.m.; Liberty Deep Down, 5 p.m.; Wet Bandits, 7 p.m.; and The McCartney Project, 9 p.m. Performers scheduled to appear Saturday include DJ Matty Sexton, noon; The Lee Gantt Band, 4 p.m.; Radio Tramps, 5:30 p.m.; Three Ton Toad, 8 p.m.
Fireworks will begin at 10:15 p.m. Saturday. For children, the Mount Carmel Kid’s Zone will feature more than a dozen rides, games and activities for children. Interactive games include a mobile zip line, extreme trampoline, skid loader bounder, construction zone obstacle course and more. Wristbands are $10 per day per child. A free kid’s area will include games and activities from Recreations Outlet and the first-ever Recreations Outlet Tots Zone for toddlers and preschoolers. Guests are encouraged to use public parking lots and street parking spaces in downtown Powell. Additional parking will be available in the Village Academy parking lot as well as along South Liberty Street. South Liberty Street will be closed to northbound traffic from 4 p.m. to midnight Friday and from 11 a.m. to midnight Saturday for parking. Bennett Parkway will serve as the detour. More information including a detailed schedule of events, list of marketplace vendors and FAQs can be found on the festival’s website festival.cityofpowell.us/. 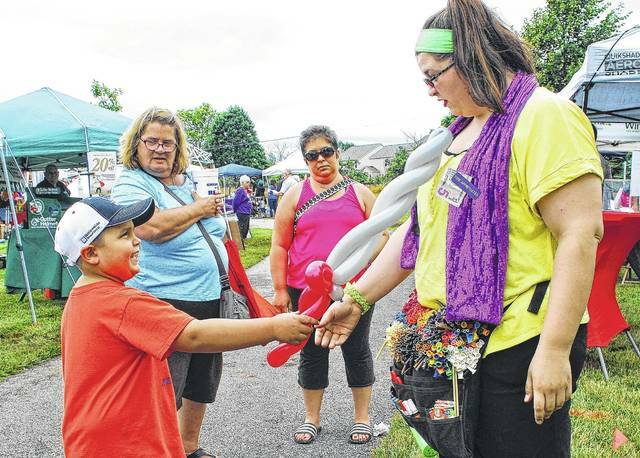 https://www.delgazette.com/wp-content/uploads/sites/40/2017/06/web1_POWELL-FESTIVAL.jpgThe annual Powell Festival, presented by Mount Carmel, is set for Friday and Saturday in Village Green Park, 47 Hall St. It will be open from 5 to 11 p.m. Friday and noon to 11 p.m. Saturday.